With TsiLang and the TsiLang Expert that comes with it, you can translate your project as quickly and easily as you play your favorite game. Close all running instances of RAD Studio, Delphi or C++ Builder. Run TsiLangTrialSetup.exe and follow the instructions. Once the installation script is completed the TsiLang Components Suite will be automatically installed into selected IDE(s). Note: If you have previously installed a trial copy of the TsiLang Components Suite, uninstall it from your PC. Make sure all its files are deleted. Run SISETUP.EXE (SIBINARY.EXE in case of DCU-Only Edition) and follow the instructions. The installation script will install source files to destination folder and adjust library path for the selected IDE(s). Note: The translation example below is a simplified sample and was used just for demonstration. Open a project for translating. Select File|Wizard in TsiLang Expert menu and click Next button on the first page of appeared Wizard. Select main form and set TsiLang type in the combo-box at the right. For all other forms in the list set TsiLangLinked. Set settings as presented on the picture below and click Next button. 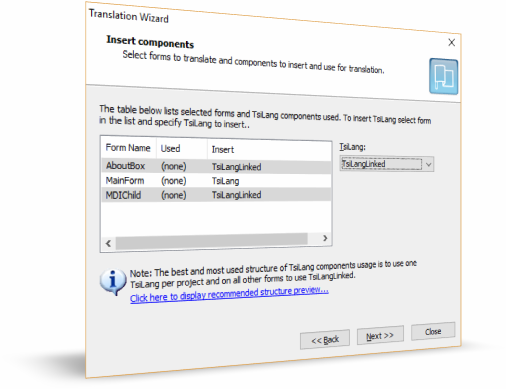 After Wizard completed double-click on the form in the TsiLang Expert to open Translation Editor. Enter translations for necessary elements. 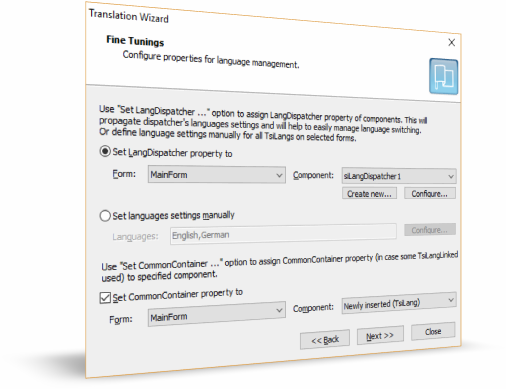 If certain components property should not change, just leave the corresponding language field empty. Click File|Close Saved in Translation Editor menu. Third, TsiLang Expert can analyze your source file, collect and translate strings and string constants used in your source code. Just select File|Source|With Form in TsiLang Expert's menu. Add the necessary fields in the TDataSet fields editor. 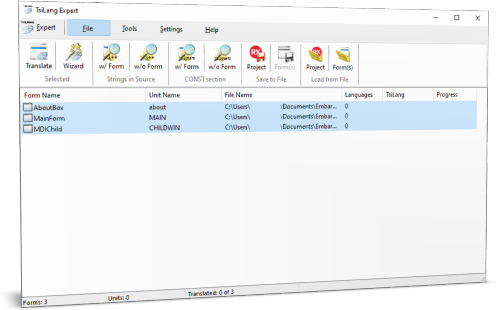 Select File|Translate in TsiLang Expert's menu. In the appeared Translation Editor select DisplayLabels node in the translations tree. Enter the values for corresponding fields' DisplayLabel property. Also you can translate grids using Collections property. 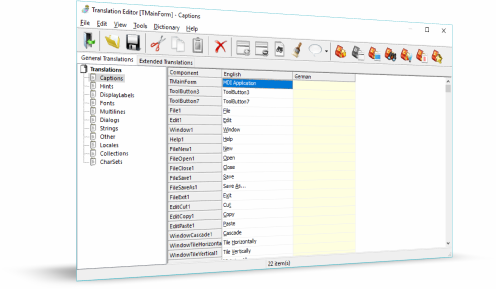 Click File|Close in Translation Editor menu. compile your project. You are ready to distribute your multilingual application and receive new sales from new regional markets!